Pallidifloside D, a saponin glycoside constituent from the total saponins of Smilax riparia, had been proved to be effective in hyperuricemic control. Allopurinol is a commonly used medication to treat hyperuricemia and its complications. In this study, we evaluated whether Pallidifloside D could enhance allopurinol’s effects by decreasing the serum uric acid level in a hyperuricemic mouse model induced by potassium oxonate. We found that, compared with allopurinol alone, the combination of allopurinol and Pallidifloside D significantly decreased the serum uric acid level and increased the urine uric acid level (both P<0.05), leading to the normalized serum and urine uric acid concentrations. Data on serum, urine creatinine and BUN supported these observations. Our results showed that the synergistic effects of allopurinol combined with Pallidifloside D was linked to the inhibition of both serum and hepatic xanthine oxidase (XOD), the down-regulation of renal mURAT1 and mGLUT9, and the up-regulation of mOAT1. Our data may have a potential value in clinical practice in the treatment of gout and other hyperuricemic conditions. Hyperuricemia, a metabolic disease, is characterized by high uric acid levels in the blood that precipitate urate crystals in both the kidneys and joints. Hyperuricemia is a well-known risk factor for gout, hypertension and diabetes . It has been demonstrated that the under-excretion of urate can result in hyperuricemia [1,2]. If urate transporters in the kidney, such as urate transporter 1 (URAT1), glucose transporter 9 (GLUT9) and organic anion transporter 1 (OAT1) are dysfunctional, they can impair the excretion of urate, resulting in hyperuricemia [2-5]. These protein transporters thus constitute essential targets for the treatment of hyperuricemia. Allopurinol is one commonly used agent to treat hyperuricemia and its complications, such as chronic gout  however, allopurinol has been reported to induce adverse effects, including hypersensitivity [7,8]. The most serious adverse effect is a hypersensitivity syndrome characterized by fever, skin rash, eosinophilia, hepatitis, and worsened renal function [9-11]. Allopurinol is a Xanthine Oxidase (XOD) inhibitor that prevents the formation of uric acid and reduces the levels of serum uric acid by decreasing purine synthesis . Careful allopurinol dosing is critical in patient treatment, and drug adverse events have been attributed to dosing escalation [12–14]. Thus, it is clinically desirable to combine a compound with allopurinol therapy to potentiate the effects of allopurinol and to reduce the required high doses of the drug for better treatment safety [6,15]. Some natural products have been effective in hyperuricemic control and gout treatment [16–18]. Smilax riparia A. DC, belonging to the genus Smilax in the family Liliaceae, is a botanical widely grown in the southern and central parts of China. The roots and rhizomes of S. riparia have been used in a Traditional Chinese Medicine (TCM) or Chinese folk drug, “Niu-Wei-Cai”, to treat the symptoms of gout and hyperuricemia-related conditions, including inflammation and some malignancies [19,20]. This herb is an edible plant in some regions of China, indicating its safety . We previously reported that Pallidifloside D, a saponin glycoside (Figure 1) constituent from the total saponins of Smilax riparia, was effective in hyperuricemic control . 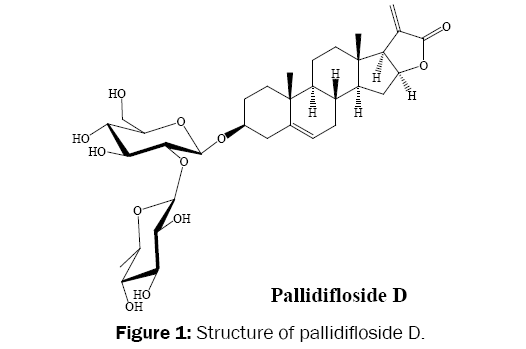 Figure 1: Structure of pallidifloside D.
In the present study, we investigated whether Pallidifloside D could potentiate allopurinol’s effects on the serum uric acid level in a hyperuricemic mouse model induced by potassium oxonate. We wanted to know whether combining Pallidifloside D with allopurinol would increase the drug’s uricosuric activities. We compared the two components alone with a combination treatment on uric acid excretion and on hyperuricemia-induced renal dysfunction. Our results showed that the synergistic effects were linked to the down-regulation of mouse renal URAT1 and GLUT9, the up-regulation of OAT1, and the inhibition of XOD. Our data suggested that using Pallidifloside D to enhance allopurinol’s uricosuric activity have a clinical value in patients suffering from hyperuricemia and its complications. All chemicals were of analytical grade. Petroleum ether, chloroform, ethyl acetate, and n-butanol were purchased from Tianjin Hengxing Chemical Reagent Company (Tianjin, PR China). Xanthine and XOD were bought from Sigma Chemicals (St Louis, MO, USA). Allopurinol and Potassium oxonate were purchased from MP Biomedicals China (Shanghai, PR China). Assay kits of XOD, UA, Cr, and BUN were obtained from Boaosheng Biotech (Beijing, PR China). The method of isolating the compound Pallidifloside D from Smilax riparia was according to the previous study we reported with a little modiﬁcation . Brieﬂy, Dried roots and rhizomes of S. riparia powder were ground and extracted with 90% EtOH. The 90% EtOH extract was suspended in water and extracted with petroleum ether, chloroform, EtOAc and BuOH, respectively. The BuOH layer were concentrated under reduced pressure to give the brown extract. The BuOH fraction was passed through a D101 macropore resin (0.25–0.84 mm) and eluted successively with 30% EtOH, 50% EtOH, 70% EtOH and 90% EtOH, respectively, and the total saponins of S. riparia were obtained from the 70% EtOH fraction. Then the total saponin fraction was passed through a Sephadex LH-20 column with MeOH, the fraction eluted with MeOH was passed through silica gel column chromatography with a CHCl3/MeOH/H2O solvent system (10:1:0.5–5:1:0.5). Finally, the fractions eluted by CHCl3/MeOH/H2O (9:1:0.5) were subjected to semi-preparative HPLC (10–100 mm) to afford pallidifloside D. HPLC showed the purity of this compound were 98.5%. Male Kunming mice (20 ± 2.0 g), eight per group, were obtained from China BK Experimental Animal Center (Beijing, China). We carried out all our experiments in compliance with the regulations and guidelines for the care of laboratory animals, and the protocol was approved by the Ethics Committee on Animal Experiments of the Tianjin Medical University. Chloral hydrate anesthesia was used in all surgical procedures to reduce the animals’ suffering to the minimum. Mouse hyperuricemia was induced by potassium oxonate, a uricase inhibitor [23,24]. To induce hyperuricemia, each animal was given an intraperitoneal injection of 250 mg/kg potassium oxonate dissolved in 0.9% NaCl solution once daily for 7 consecutive days. Mouse allopurinol and pallidifloside D doses were determined based on conversion from human clinical practice and our preliminary studies [25,26]. The test agents (allopurinol and pallidifloside D), alone or in combination, were dispersed in 0.3% carboxymethyl cellulose sodium (CMC)-Na aqueous solution and were orally administered once daily from day 1 to day 7; the normal control mice were treated with a solvent vehicle. After 7 days of treatment, food was removed from the cages 12 h before the mice were sacrificed. No adverse events were observed in the experimental animals during the 7-day observation period. The blood was kept clotted for 1 h at 25°C and was centrifuged at 3,000 rpm for 10 min to collect the serum. The serum and urine were kept at -20°C before testing . The levels of Uric Acid (UA), creatinine (Cr), Blood Urea Nitrogen (BUN), and Xanthine Oxidase (XOD) activities in the liver and kidneys were determined by the colorimetric method using commercial kits (Beijing Aoboseng Bioengineering Institute, China), based on the instructions of the manufacturers. In addition, the cortex of the kidneys was quickly and precisely separated on an ice-plate and kept at -80°C for a protein analysis of mouse renal URAT1, GLUT9 and OAT1. An enhanced mice renal cortical brush-border membrane vesicle was used to analyze mURAT1, mGLUT9, mOAT1 and mNa+-K+ ATPase [29,30]. The immunoblotting was assayed using anti-URAT1 (1:200), mGLUT9 (1:200), mOAT1 (1:200) as well as mGAPDH (1:400) antibodies (Santa Cruz Biotech, Dallas, TX, USA). Molecular Analyst software (Bio-Rad Laboratories, Hercules, CA, USA) was used to detect the composition of the target proteins, based on the contents that were normalized/standardized by blottings from mNa+-K+ ATPase or mGAPDH. Data were presented as mean ± standard error (S.E.). One-way analysis of variance (ANOVA) was applied to estimate the significance level. A value of P<0.05 was considered statistically significant. Statistical Analysis System (Graph Pad Prism 4, Graph Pad Software, and San Diego, CA, USA) was used for the data analysis of this study. As shown in Figure 2, after the intraperitoneal administration of potassium oxonate for 7 days, the model group had a significantly higher level of serum uric acid (SUA) compared with that of normal control group (P<0.01), indicating that the hyperuricemic mouse model was effectively established. Compared with the model group, the SUA level was significantly reduced after treatment with 5 mg/kg allopurinol (P<0.05; Figure 2A). At the same time, the level of urine uric acid (UUA) increased significantly, suggesting increased excretion of renal uric acid (P<0.05; Figure 2B). Figures 2A and 2B also show that 5 mg/kg pallidifloside D triggered significant anti-hyperuricemic activity, although less than that of allopurinol. Interestingly, when allopurinol (5 mg/kg) and pallidifloside D (5 mg/kg) were given together to the experimental animals, the SUA level was significantly reduced and the UUA level was significantly increased (both P<0.01 compared to the model group). The pallidifloside D administration with allopurinol significantly enhanced the effects of allopurinol on SUA and UUA (both P<0.05 compared to the effects of allopurinol alone). The effects of the combination treatment almost normalized SUA and UUA to levels observed in the control group. Figure 2: Effects of allopurinol, pallidifloside D, and their combination on serum uric acid (A) and urine uric acid (B) in hyperuricemic mice. N=8 per group. Control, normal control; Model, model group, induced with potassium oxonate; AP, allopurinol (5 mg/kg); PD, pallidifloside D (5 mg/kg); AP + PD, allopurinol (5 mg/kg) plus pallidifloside D (5 mg/kg). ## P < 0.01 compared with the normal control; *P < 0.05 and **P<0.01, compared with the model group. As shown in Figure 3, we evaluated the levels of serum creatinine (SCr) and urine creatinine (UCr) in our experimental animals because there is a close correlation between creatinine and uric acid synthesis in gout patients [31–33]. As expected, the model group had a significantly higher SCr level compared to that of the control group (P<0.01). After allopurinol alone and pallidifloside D plus allopurinol, the SCr levels were significantly reduced (P<0.05 and P<0.01 respectively). Pallidifloside D alone did not affect either SCr or UCr, but in combination with allopurinol had significant effects (both P<0.01; Figure 3A and 3B). As shown in Figure 4A, the model group had a significantly higher BUN level compared with the level in the control group (P<0.01), suggesting reduced urea clearance and renal dysfunction . After treatment with allopurinol alone or allopurinol in combination with pallidifloside D, the BUN level was significantly reduced (P<0.05 and P<0.01, respectively). Accordingly, as shown in Figure 4B, data on the fractional excretion of urate (FEUA) supported changes in the BUN level after different treatments (Figure 4B). Figure 4: Effects of allopurinol, pallidifloside D, and their combination on blood urea nitrogen (BUN) (A) and fractional excretion of urate (FEUA) (B) in hyperuricemic mice. N=8 per group. Control, normal control; Model, model group, induced with potassium oxonate; AP, allopurinol (5 mg/kg); PD, pallidifloside D (5 mg/kg); AP+PD, allopurinol (5 mg/kg) plus pallidifloside D (5 mg/kg). ## P<0.01 compared with the normal control; **P<0.01, *P<0.05 compared with the model group. Allopurinol, an XOD inhibitor, has been used to treat hyperuricemic and gout symptoms. As shown in Figure 5A, allopurinol had significant effects on serum XOD in hyperuricemic mice (P<0.01). Allopurinol in combination with pallidifloside D significantly suppressed the serum XOD level, to a level even lower than that in the control group (P<0.01; Figure 5A). We observed a similar synergetic effect of allopurinol in combination with pallidifloside D on the hepatic XOD level (P<0.01); pallidifloside D alone had only a small effect on the serum and hepatic XOD level (Figure 5A and Figure 5B). These data suggest that the enhanced effects of pallidifloside D on allopurinol are linked to the change in XOD activity. Figure 5: Effects of allopurinol, pallidifloside D, and their combination on XOD levels in the serum (A) and liver (B) of hyperuricemic mice. N=8 per group. Control, normal control; Model, model group, induced with potassium oxonate; AP, allopurinol (5 mg/kg); PD, pallidifloside D (5 mg/kg); AP+PD, allopurinol (5 mg/kg) plus pallidifloside D (5 mg/kg). ## P<0.01 compared with the normal control; **P<0.01, *P<0.05 compared with the model group. The effects of allopurinol, pallidifloside D, and their combination on the renal protein levels of mURAT1, mGLUT9 and mOAT1 in hyperuricemic mice are demonstrated in Figure 6. Significantly elevated levels of renal mURAT1 and mGLUT9 and depressed levels of mOAT1 were observed in hyperuricemic animals (all P<0.01), but not in the animals in the control group (Figures 6A- 6C). Allopurinol significantly down-regulated the expression of renal mURAT1 and mGLUT9 and up-regulated the expression of renal mOAT1 (P<0.01, P<0.01, and P<0.05, respectively; Figures 6A-6C) compared to the model group. Moreover, pallidifloside D further enhanced the observed changes compared with allopurinol alone, especially on mOAT1 (all P<0.01). 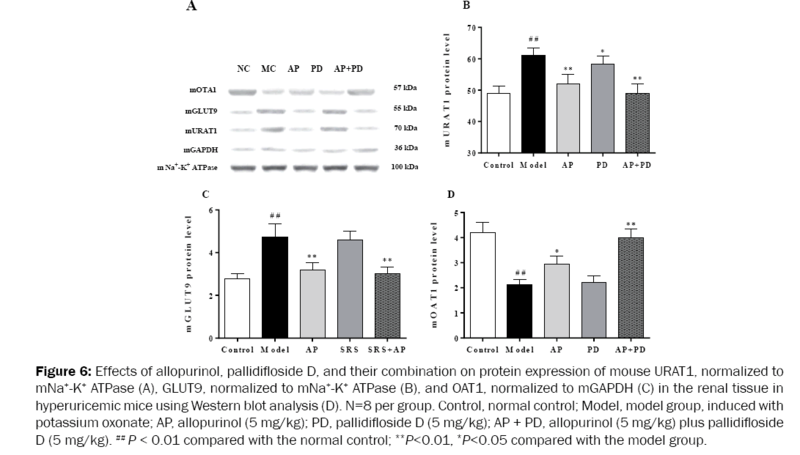 Figure 6: Effects of allopurinol, pallidifloside D, and their combination on protein expression of mouse URAT1, normalized to mNa+-K+ ATPase (A), GLUT9, normalized to mNa+-K+ ATPase (B), and OAT1, normalized to mGAPDH (C) in the renal tissue in hyperuricemic mice using Western blot analysis (D). N=8 per group. Control, normal control; Model, model group, induced with potassium oxonate; AP, allopurinol (5 mg/kg); PD, pallidifloside D (5 mg/kg); AP + PD, allopurinol (5 mg/kg) plus pallidifloside D (5 mg/kg). ## P < 0.01 compared with the normal control; **P<0.01, *P<0.05 compared with the model group. Allopurinol is a commonly used medication for the treatment of patients with gout and other hyperuricemic conditions. Among patients who received allopurinol, drug-related adverse effects were often reported, including severe and fatal life events such as allopurinol hypersensitivity syndrome . More seriously, allopurinol may cause the onset of toxic epidermal necrolysis and Stevens-Johnson syndrome, both of which are life-threatening dermal conditions . Pharmacologically, it is possible to use other compounds or natural products to enhance the therapeutic effects of allopurinol while reducing the drug doses. As a result, the dose-related adverse events of allopurinol can be subsequently reduced. S. riparia has been used as a component in Chinese herbal medicine to treat gout and other hyperuricemic symptoms for hundreds of years [19,20]. As an edible plant  S. riparia is expected to be safe for use in humans, even at a high dosage. We previously reported that Pallidifloside D, a saponin glycoside constituent from the total saponins of Smilax riparia, was effective in hyperuricemic control . In this study, we evaluated whether pallidifloside D from S. riparia would enhance the effects of allopurinol on serum uric acid levels using a hyperuricemic mouse model. A potassium oxonate-induced hyperuricemia is an established animal model. Our data showed that the effects of allopurinol could be significantly enhanced after co-administration with pallidifloside D. The combination of allopurinol and pallidifloside D significantly increased the urine uric acid level, accompanied by a remarkable serum uric acid level reduction. The increased levels of serum creatinine and BUN signal renal dysfunction, leading to impaired kidney function [31,33,34]. The combination of allopurinol and pallidifloside D reduced the serum creatinine level compared to the levels when allopurinol was administered alone. Moreover, the index of the fractional excretion of urate (FEUA) supported this synergistic effect. To explore the underlying mechanisms of action, we evaluated the compound’s effects on XOD activity. The allopurinol and pallidifloside D combination reduced serum XOD level to a level even lower than that of the control group. Accordingly, the combination treatment also induced similar changes in hepatic XOD activity, suggesting that the changes contributed to the observed effects with combination treatment. The levels of mouse URAT1, GLUT9 and OAT1 proteins are associated with renal uric acid excretion [2–5]. Our Western blot data showed that allopurinol significantly down-regulated the expression of renal mURAT1 and mGLUT9 while up-regulating the expression of renal mOAT1 in the hyperuricemic mice, compared with the model group. The combined administration of the two compounds down-regulated and up-regulated the expression of the related proteins in the experimental animals, providing information about the mechanism of enhancement of allopurinol by pallidifloside D.
As an edible plant, S. riparia has a good safety record in humans. It is reasonable to consider that as a compound from S. riparia, pallidifloside D combined with allopurinol to reduce the clinically required high doses of allopurinol. As a result, the commonly reported dose-related adverse effects of allopurinol could be attenuated. We investigated the possible synergistic effects of pallidifloside D and allopurinol in reducing serum uric acid levels in a hyperuricemic mouse model. Compared with pallidifloside D or allopurinol alone, the combination administration of the two components possessed better uricosuric activity. The observed results were linked to the inhibition of XOD, the down-regulation of renal mURAT1 and GLUT9, and the up-regulation of OAT1. Our data may have a potential value in clinical practice in treating gout and other hyperuricemic conditions. The work was supported in part by the Tang Foundations, the National Nature Science Foundation of China (No. 81202895), and the Post-Doctoral Program Foundation from the Ministry of Personnel of China (No. 2013M 530882) and the Post-Doctoral Special Program Foundation from the Ministry of Personnel of China (No. 2014T70223). Boffetta P et al. A prospective study of gout and cancer. Eur. J. Cancer. Prev. 200918: 127–132. Habu Y et al. Decreased activity of basolateral organic ion transports in hyperuricemic rat kidney: roles of organic ion transporters, rOAT1, rOAT3 and rOCT2. Biochem. Pharmacol. 200366: 1107–1114. Enomoto A and EndouH. Roles of organic anion transporters (OATs) and a urate transporter (URAT1) in the pathophysiology of human disease. Clin. Exp. Nephrol. 20059: 195–205. Eraly SA et al.Multiple organic anion transporters contribute to net renal excretion of uric acid. Physiol. Genomics.200833:180–192. Preitner F et al.Glut9 is a major regulator of urate homeostasis and its genetic inactivation induces hyperuricosuria and urate nephropathy. Proc. Natl. Acad. Sci. U. S. A.2009106: 11501–11506. Pacher P et al.Therapeutic Effects of Xanthine Oxidase Inhibitors: Renaissance Half a Century after the Discovery of Allopurinol. Pharmacol. Rev.200658: 87–114. Bardin T, Current management of gout in patients unresponsive or allergic to allopurinol. Joint. Bone. Spine. 200471: 481–485. Harris M.D et al. Gout and hyperuricemia. Am. Fam. Physician.199959: 925–934. Cameron JS, Gout, uric acid and purine metabolism in paediatric nephrology. Pediatr. Nephrol. 19937: 105–118. Halevy, S et al. Allopurinol is the most common cause of Stevens-Johnson syndrome and toxic epidermal necrolysis in Europe and Israel. J. Am. Acad. Dermatol.200858: 25–32. Tsai TF and Yeh TY. Allopurinol in dermatology. Am. J. Clin. Dermatol.201011: 225–232. Dalbeth N and Stamp L. Allopurinol Dosing in Renal Impairment: Walking the Tightrope Between Adequate Urate Lowering and Adverse Events.Metabolism200756: 1179–1186. McInnes GT et al. Acute adverse reactions attributed to allopurinol in hospitalised patients. Ann. Rheum. Dis.198140: 245–249. Vázquez-Mellado J, Relation between adverse events associated with allopurinol and renal function in patients with gout. Ann. Rheum. Dis.200160: 981–983. An J et al. Reparatory and preventive effects of oriental herb extract mixture (OHEM) on hyperuricemia and gout. Food. Sci. Biotechnol. 201019: 517–524. Meng ZQ et al. Study on the anti-gout activity of chlorogenic Acid: improvement on hyperuricemia and gouty inflammation. Am. J. Chin. Med. 201442, 1471–1483. NisarA et al. Effect of Ajugabracteosa on systemic T-cell immunity in Balb/C mice: dual Th1/Th2 immunostimulatory effects. Am. J. Chin. Med. 201442: 375–392. Wang CZ et al. Trends in scientific publications of Chinese medicine. Am. J. Chin. Med. 201240: 1099–1108. Wang WX et al.Tumoral cytotoxic and antioxidativephenylpropanoid glycosides in Smilax riparia A. DC. J. Ethnopharmacol. 2013149: 527–532. Zhang SL, Textural research of categories and functions on Nian-Yu-Xu recorded in Cai-Yao-Lu from Ben-Cao-Gang-Mu-Shi-Yi. J. Zhejiang Univ. TCM. 201236: 484–486. Wang WH et al. The nutrition composition analysis of Smilax riparia A.DC.Spec. Wild. Econ. Anim. Plant. Res. 20003: 46–47. Wu XH et al. Pallidifloside D a saponin glycoside constituent from Smilax riparia, resist to hyperuricemia based on URAT1 and GLUT9 in hyperuricemic mice. J. Ethnopharmacol. 2014157: 201–205. Li JM et al. Protective effects of cortex fraxinicoumarines against oxonate-induced-hyperuricemia and renal dysfunction in mice. Eur. J. Pharmacol.2011666: 196–204. Wang X et al. The dual actions of Sanmiao wan as a hypouricemic agent: down-regulation of hepatic XOD and renal mURAT1 in hyperuricemic mice. J. Ethnopharmacol.2010128: 107–115. Chinese Pharmacopoeia Committee. Pharmacopoeia of the People’s Republic of China. Chemical Industry Press, Beijing 2005 pp. 50. Wu XH et al. Smilax riparia reduces hyperuricemia in mice as a potential treatment of gout. Am. J. Chin. Med. 201442: 257–259. Dong LY et al.Cardioprotection of vitexin on myocardial ischemia/reperfusion injury in rat via regulating inflammatory cytokines and MAPK pathway. Am. J. Chin. Med. 201341: 1251–1266. Kong LD et al. A Chinese herbal medicine Ermiao wan reduces serum uric acid level and inhibits liver xanthine dehydrogenase and xanthine oxidase in mice. J. Ethnopharmacol.200493: 325–330. Hosoyamada M et al. Function and localization of urate transporter 1 in mouse kidney. J.Am. Soc. Nephrol.200415: 261–268. Liu AH et al. Cardio-protection by Ginkgo biloba extract 50 in rats with acute myocardial infarction is related to Na⁺-Ca²⁺ exchanger. Am. J. Chin. Med. 201341: 789–800. Fan CY et al.Betaine supplementation protects against high-fructose-induced renal injury in rats.J. Nutr. Biochem. 201425: 353–362. Han Y et al. Selective therapeutic effect of Cornusofficinalis fruits on the damage of different organs in STZ-induced diabetic rats. Am. J. Chin. Med. 201442: 1169–1182. Hoffmann Det al. Evaluation of a urinary kidney biomarker panel in rat models of acute and subchronic nephrotoxicity. Toxicology2010277: 49–58. ZoccaliC andMallamaci F. Uric acid hypertension and cardiovascular and renal complications.Curr. Hypertens. Rep.201315: 531–537.